Remember these Prada sunnies? I got them for Christmas last year and wore them a bunch on the blog the first few months of 2014, until they sold out everywhere! After several months of keeping these shades on the back burner, I’m bringing them back out to play! Good news for you: this style is now available in a slew of spring shades and in tortoise! I’m really tempted to order the pale pink pair. There’s also a similar Prada pair with a slimmer frame which is another great alternative if you’re still wanting more neutral tones like black, tortoise or ivory. They have that same geometric shape and metal bridge, just a bit smaller so the look doesn’t take over your face. This outfit actually contains a few other oldies (but goodies). This BCBGMAXAZRIA faux-leather sleeved blazer is one I picked up at the Carlsbad Outlet Mall some three years ago – I actually bought it right when I first started doing outfit posts on here! Kinda crazy how the time flies. The other is this pleated + braided Rag & Bone leather skirt. This skirt has been through the ringer – I’ve worn it so much over the past two years! Both are great basics and look good dressed down or up, making them an easy choice and constant go-to in my closet. A few similar items I recommend (since these two items are no longer available), include this Vince drape-front jacket, this faux leather lapel Topshop blazer, this pleated leather mini skirt and this longer pleated one by Rebecca Taylor. Love this! All black never gets old. Gorgeous skirt and jacket! Lovely style! Love this skirt and the bag! This all black look looks amazing on you! That skirt is stunning and love this all black look. Favorite outfit ever! Love this! So chic! Looove this outfit! And those sunglasses are gorgeous, checking them out! I love how this outfit is made up of classic, beautiful basics! You look lovely! That blazer with the faux leather sleeves is seriously so chic. And I LOVE that Rag and Bone skirt! Probably my favorite outfit on you! Absolutely fabulous outfit! Love that leather skirt! I’m really tempted to pick up those sunnies!!!!! You look so polished in this look, love!! 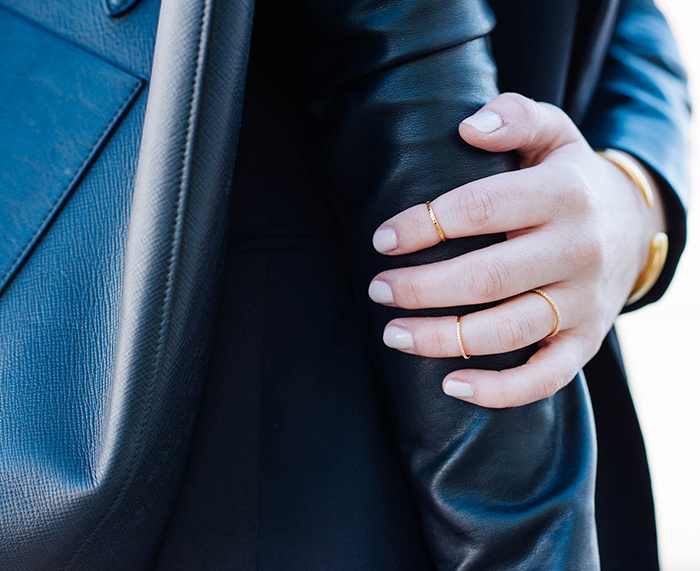 You look amazing in this black look and loving the leather touches. Also, obsessed with the ring stacking going on! I love those sunnies! I’ve been wanting to get them for a while :) I actually have the same jacket and I wear it all the time because it’s so easy to mix and match. That one is def one of my staples. Thanks for sharing this look! They may be old, but they still look great. You look awesome! I really like the entire ensemble, but I’m a sucker for black. love the look! the skirt and rings are fabulous! 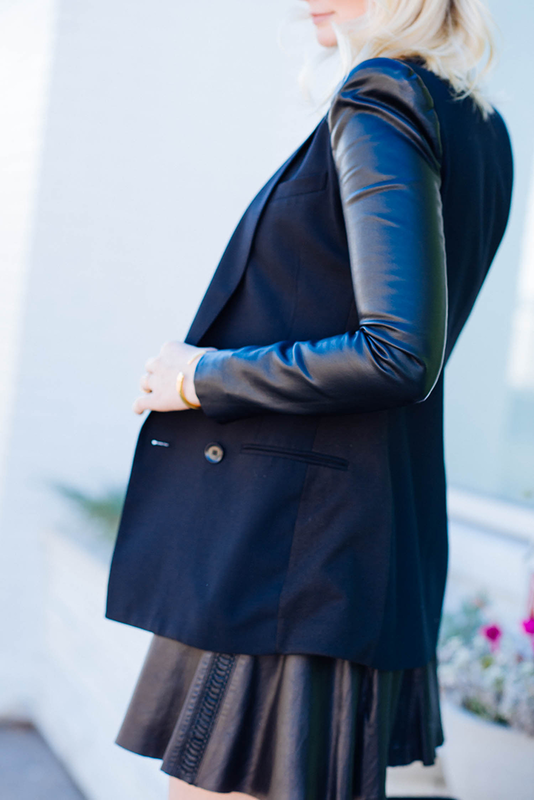 A leather sleeved blazer.. Theres nothing better. By the way – your hair has been looking amazinggg. What have you been using!? Fill me in on your secret! Beautiful! That last photo of you is seriously stunning. Love the all black and how it contrasts with your light hair and skin. Love this outfit! So polished! I am obsessed with my pair, I feel like they make ANYTHING fab! 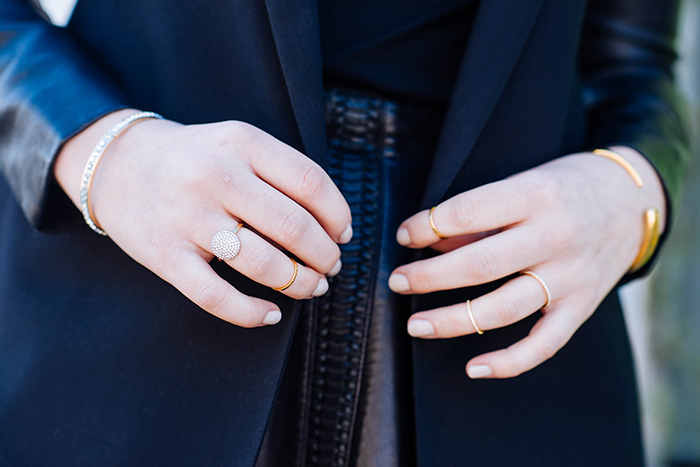 Love your dainty gold rings! So pretty! Love the all black and leather look. This look is so chic with your fair skin and hair–love it!